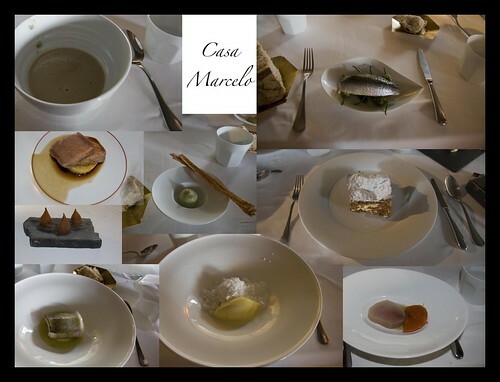 Santiago's only Michelin stared restaurant, Casa Marcelo, is not a venue I find myself in terribly often, but the occasional opportunity arises when such visits are sadly inescapable. Indeed having a couple of good friends from home here for a few days seemed the perfect opportunity, so we took ourselves off there for a taste of the degustation menu and a little over-indulgence! The nine courses are all stunningly prepared and their simple combinations of flavour work well together. Except for the liquid nitrogen fuelled pudding with frozen meringue and pina colada icecream, there were few real wow moments, but plenty of extremely satisfying morsels of perfectly cooked fish, meat and vegetables. The fish in particular was perhaps the best prepared I've tasted outside of Japan and the country beef was stunningly succulent. Of course the attention to detail, the immaculate service, the helpful but not overly serious waiters and waitresses and the overall atmosphere go to making it an excellent experience for what is not a vast price for a Michelin stared meal, however I did feel on several occasions that the actual flavour combinations were a little simple for my tastes. The only real let down for me was the mushroom soup, made with expensive and highly prized boletus mushrooms which was delicate but a little underwhelming for my liking. Anyway, the degustation menu is around 60 euros per person (plus wine, which we were abstaining from on this occasion) and as someone who doesn't spend a lot of money on many luxuries that are not food based, I think that's a very fair price for several hours of gastronomic joy. Cream of porcini mushroom soup, grilled sardine with Pimientos de Padron, Mille fuille with vanilla cream, tuna with tomato, frozen meringue with pina colada icecream, sea bass with lemon and olive oil, cinnamon truffles, country beef and potato, and anchovy taramasalata with crisp bread. Hi there Andy, thanks for stopping by, and I'm pleased you enjoy the content. It's a fun motivation for getting out there and getting lots done.